How cute is this little booger?? If he ain’t nothin’ else, he’s incredibly handsome. But he is more. So much more. Shepherd has come an incredibly long way since we first held him in the Guangdong Civil Affairs office, almost 8 months ago. In fact, it’s hard for me to go back and watch the videos we took of him in China, he’s such a rag doll! At the time, I knew he had some significant delays. But for some reason, looking back now, makes me sick to my stomach. It’s so good to be 8 months down the road looking back, I gots to say! Shepherd is now officially walking everywhere! We decided, right around Christmas time, that we were tired of throwing out his jeans because of all the holes in the knees… it was time to go upright! So we committed to encouraging him to walk instead of ‘uber-crawling’, his super fast way of locomoting that he preferred to walking. By the time I got back from China he was walking and hasn’t stopped since. And he is pumped to be like his big bro Jude. Pretty cute. Shepherd is talking like crazy as well. We had his hearing tested in October and weren’t surprised to find out that his hearing was significantly affected by fluid in his ears. In fact, we were told after an in-depth hearing evaluation that his hearing was about 35% less than it could be. In November we had tubes placed and while there was no lightning – bolt language acquisition, we did notice him begin to talk more. But just in the last month, his words have lost the nasal-y, poorly enunciated quality and now they sound like real baby words! Like “me do it!” and “daddy bye bye” are, amazingly, coming out of this little guy’s mouth! We are so thrilled to witness his progress… we were told that children from his particular orphanage speak very little, due to the fact that they were never spoken to by the caretakers. Heartbreaking. He is also beginning to gain weight. It’s so nice to, at last, see a bit of additional weight on his tiny frame! He had giardia when we brought him home and we mistakenly believed that once we had completed the Rx, that things would resolve and he’d begin to gain weight. Not so. It has been at least 6 months since he was treated and he is just now beginning to be able to digest food normally. Evidently, long term giardia can really leave your gut a mess. He is a good eater, not so much for quantity but for selection… he’s not picky at all. It’s just a matter of being able to sit there long enough to wait for him to chew up enough food to actually count as a meal. And we still give him 2 bottles a day for additional calories. We add a good bit of heavy whipping cream for additional fat in his diet and it has really helped. Must be nice. All I’m gonna say ’bout that. Shepherd loves his towel. In fact, if he could, he’d totally be a Linus. We have managed to limit his ‘towel time’ to naps and bedtime, but it has been and continues to be a favorite of his. Good thing that just any old white kitchen towel will do! He also loves his brother’s train set. He and Jude spend hours (okay, really about 15 minutes at a time, but it’s like hours… in toddler-time) setting up their wooden train tracks on the floor. Of course, fighting ensues sooner or later and we have to break up the clonking- of- each- other- on- the- head- with- a- train. But Shepherd is definitely learning to hold his own and we know that the two of them are going to be big buddies. Someday. He is Beautiful and so glad that is his doing so good. Our daughter is from the same orphanage and has been home for 5 months now. She is talking alot also. Your sweet Shepherd is amazingly beautiful. One seriously good looking kiddo! Oh it broke my heart when I read that the workers hardly talk to the children at the orphanage. How in the world can you look into their sweet little faces and not talk to them, kiss them and cuddle them? Glad Shepherd is doing so well! Oh, sweet Shepherd, I love hearing how well he is doing. It is heart-breaking knowing that my daughter is waiting in that same orphanage right now. My stomach is in knots. You will have to give me tips on getting rid of that Giardia, I will be praying that my little one escapes this one. We just received photos where she is clutching a plain white towel. It does my heart good to see Shepherd thriving! thank you for the update! we are traveling in about 1 month to bring home our daughter. posts like this get me very excited to see the child immerge that God created them to be! Shepherd is the cutest little boy! He is just captivating…those eyes are gorgeous!!! oh, i am sooo happy to read a shepherd update! awesome! thank you for sharing! did you edit thos ein lightroom? they look amazing! HE is OFF THE CHARTS in cuteness! So glad he is doing so well…some good old family lovin’ and good food will do that for a kid! What great pictures of your gorgeous little fella. He is just so cute!! It’s great to hear about all the progress he has been making. Isn’t it sad about not being spoken to in the orphanage? It just breaks my heart. At nearly three-years old, we never heard Leila say one word in Russian. Not one. And we believe it was for the same reason. I’m so glad to hear Shepherd’s vocabulary is taking off! What an adorable little man!!! It sounds like he has come so far. It is amazing the changes that can happen in the lives of these special children. What a handsome boy. Way to go Sheperd, you’ve come a long way!! Our daughter Hope adopted two yrs. ago had giardia, was treated three times and still has issues. I know what you went through!! I tell you, he just takes my breath away. he always has…I just find Shepherd to be so incredibly handsome. I am so happy to hear about all his wonderful milestones. That face is so sweet..I could just eat him up! What a joy it is to hear about Shepherd….I am so glad that he is doing so well! He is a cutie!! What a precious little butterball!! It is so, so nice to see updates like this. It helps so many through the transition times. He is so precious – what a smile!! I love how God uses the power of a loving family to transform little “ragdolls” into healthy, smiling sweet bundles of joy! How faithful the Lord is!! What treasures you have! He couldn’t be more adorable. What an absolute sweetheart! 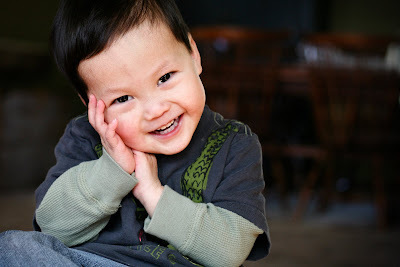 Fabulous Photos of that adorable little man! What a difference 8 months can make!!!! It is obvious that he is one VERY loved boy!!! Thank you for updating about him. It is so encouraging!!!! One more time… GREAT pics!!! So, so glad he is doing well!! I was hoping to hear something about sweet little Shepherd. He is one handsome fella! So glad that he is thriving & coming along. My daughter went through the Giardia experience also. After two rounds of strong medicine it was finally resolved. I cannot believe how handsome little Shepherd is!! Oh, how he has changed! The pictures are awesome, great job on the photography! I need to purchase a new camera, if only I had checked your blog earlier!!! Way to bust a move, Shep! You’ve come a long way, Little Buddy. What an adorable boy! Glad he is finally gaining some weight. We’ve got a peanut of a boy over here too, though no giardia…that must have been a rough few months of diapers! He looks delightfully happy! I see so much of Raegan in Shepherd 🙂 What a handsome little guy he is!! Like you, we are still working on the eating … considering that she went the first two years without having to chew anything!! Raegan never spoke a word of Chinese which just confirmed the fact that she was never talked to or encouraged to talk. and Giardia .. still makes me sad that it can be prevented! Please let me squeeze him. Be still my heart! Great update Stefanie! I can’t believe it’s been EIGHT months? My, the time flies! Praise the Lord that little pun’kin is home forever! He is such a hansome little guy ! My Malia has a “towel” too, hers is pink and you would think it is attached to her hand. Great Pictures. I swear it feels like yesterday I was following your trip to get sweet Shepherd. How time flies. Well, he's just as cute, perhaps more so now.And the tubes…A MIRACLE I TELL YOU! My Mia was 97% deaf in her left ear and 86% in the right ear due to the fluid and since May…it's like I have a new girl. The power of love is an amazing force. The love of the Father for us and in turn, our ability to love others…..healing happens because of LOVE! Shepherd is just gorgeous. I can’t believe it has been 5 months already! WOW! I can’t believe little Jude has another birthday on Monday! 5 months…where did I get that…numbers were never my strong suit…8 months holy cow…really 8 months? amazing. Shepherd is gorgeous, great photos, love the light on his face! My two Littles both had giardia (as did the rest of us!) when we brought them home – no fun! It is so good to hear how well Shepherd is doing now! Our 2.5 year old daughter who has been home 10 months has seemed to just click in the past few weeks in every area – we are enjoying her so much! Isn’t it amazing? What a strikingly handsome boy! It is wonderful to see the progress he has made in such a short time. 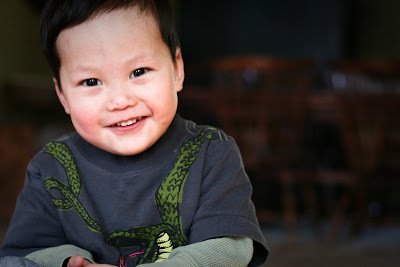 How I ache to bring home a little boy from China! Thanks so much for updating on this super handsome little guy I’m so thrilled with the progress he is making! I can’t tell you how encouraging it is! What a sweetie!!! So glad to hear how well he is doing! How is your sister doing with her new son? I always look for an update on myadoption but have not seen one yet. It is so encouraging to hear about how far he has come in such a short time. He is such a handsome boy! He is absolutely the most handsome little guy !!!! What a beautiful story, thank you so much for sharing it. Another thing he is doing so well because he has great parents!! He is such a doll. I really enjoyed reading this post and seeing how well he is doing. Everyday is growth…Our Cana has come so far…she still has a bit to go but I’m glad we are here. How I love reading about your children. You write so beautifully and your love just shines through everything you do. Your blog is truly one of my favorite blogs out there. Shepherd’s smile says it all…and his eyes just beam! 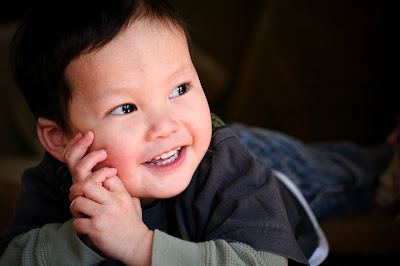 I am truly amazed… and wow, he is turning into one GORGEOUS (not just smart, bright, growing) little boy! Shepherd is adorable! I am glad of his progress he is making with talking and eating. We use Heavy Whipping Cream in our house every single day in one of my kid’s milkshake and it has been a lifesaver! Have you looked into probiotics? We used Nature’s Way Primadophilus Reuteri when they were his age and it also helped with growth. Our daughter was a washcloth girl. She came with one on Gotcha Day! I think it’s because lovies are non-existent in orphanages. But they have towels!